Yesterday my husband said "let's go for a drive." "Where?" is always my answer. "Let's go to quilt stores out and away from Sacramento so you can buy some more Roy by Row kits." Don't you just love him? How many husbands would be willing to drive all over and sit outside quilt stores while we are in shopping? Not many, I am sure. Yep, he is a keeper. One of the places we went to was the Sew So Shop in Yuba City California. Yes, I know, it used to be in Marysville - just across the river from Yuba City. That is were we went first and it was not there! Oh no! Where did it go? Is it gone completely? So I searched it on my trusty i-Pad that I am beginning to carry with us whenever we leave the Sacramento area. We found it and off we went to find the new location. I asked when I got there how long they have been in that space, as I was used to them being in the old downtown of Marysville. Four years. Oops. I guess I had not been up there for a while. It is in a strip mall that has lots of parking (as opposed to the old location). It is also in a large floor space, which provides them with a huge classroom area that is bordered by windows on two sides. Lots of natural lighting for quilters' eyes. There were two ladies in there learning how to program the long arm quilt machines that use the computer to do the quilting. One was setting up a quilt. The other was squaring a finished quilt up. They must also sell sewing machines. They had big ones and little ones sitting around. Did not pay too much attention to them, as I am not in the market for a new machine. They do carry a lot of fabric, especially batiks. I was good, though. I looked. I touched. But I did not buy. While I was there, I signed up for their mailing list. Yuba City isn't that far to get in on a good deal or to take that special class. As I was signing up in the book they had available, I noticed the three names at the top of the page were people I knew. In fact one was an employee at Beehive Quilts when it was open. Cindy, I miss you. I bet they were out doing the same thing Gil and I were doing - buying Row by Row kits. Oh I did buy their Row by Row kits and license plate. I will post a picture when I complete the row. I actually made this last week. I just got around to taking a photo of it. This is from the kit my Secret Pal from River City Guild gave to me in July. 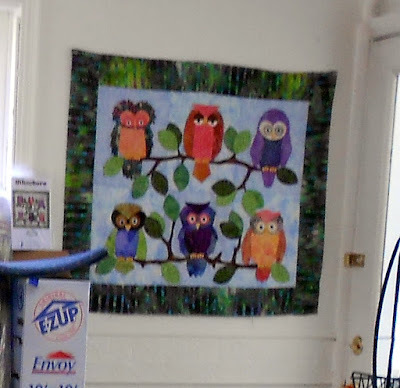 It is from the Cornerstone Quilt shop in Fairfield California. I really love it. The background fabric has little ships in it then I appliqued the larger sail ship in front. It really gives dimension to the row. I have to tell you I got it all finished and hung it on my design wall to be able to step back and see what it looked like from afar. Whoops one of the white/sand blocks was backwards. I had to take it out and put it back in. Hard to do when you have everything where it should be. I thought of leaving it because up close you couldn't even notice it. But from far away - there it was staring at me. I have three more kits now to do. Must consider putting them on my project schedule to work on. Will post them when I get them completed. Gil needed to go to Danville to buy a new-to-him guitar. I went along for the ride. While he was trying out his guitar, I searched the internet to find the closest quilt store. Believe it or not, it was less than a mile away from where we were. Since I have been trying to get more of the Row by Row (RBR) kits/patterns, I wanted to go see theirs. It is a tiny shop in a darling little shopping area. But it was well worth going to. I purchased their RBR kit. They had a class going on. I stepped into the class area to see what they were working on. I talked to the two ladies that were working the shop for a while. I bought some Halloween fabric - I know, I know, what a surprise! It was fun. I love seeing the different shops when I am out and about. Everybody seems to buy from different vendors. The fabrics are always so different. Love it.